Poetry and the Involved Reader. I had a poetry professor once, who I loved and who gave me wonderful advice on poems during my time at JMU, who believed that the reader must come more than half way to be part of the poem. By this I mean that a reader who simply reads with the bare minimum interest will miss the point of the poem. This is, of course, a sad thought, since most readers are pretty dissinterested to begin with, so asking them to get up and grab a dictionary or their unabridged version of Shakespeare to check a reference is a tall order. 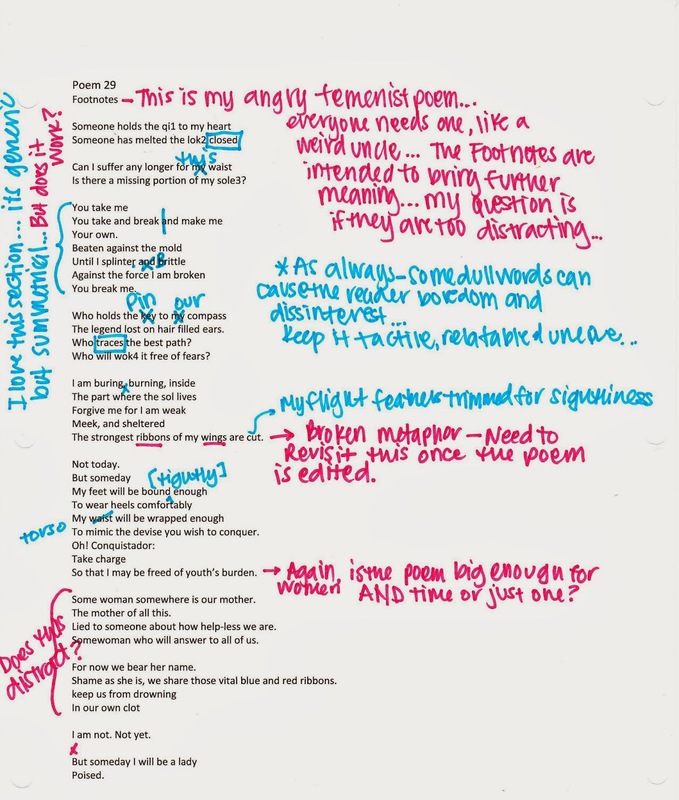 Her take on footnotes, and their use in a poem (since much of what was read in undergrad was from an anthology, which was saturated with footnotes of all kinds) was that a poem should give enough without an explanation, but have plenty there to delve into if a reader is particularly interested. She gave an example of a poem on boating, where she used a very specific word that only a sailor would know off hand. Without looking it up, the poem is still strong, but with the knowledge of that word, the meaning ripens. Again, it’s a tall order. But not out of the question. The Nook(R) can look up words on the page you’re reading. I have a suspicion that the Kindle(R) can do the same. Those devices, as well as the digitized dictionaruies and translators we carry around in our pockets to Tweet make learing above and beyond a simple task. The real question becomes, will a reader be willing to go the extra mile? Can you trust them to take the poem off the page? This poem, Footnotes, was a poem that depended on the misuse of language to prove a point… all that feminist crap aside, the language without the meanings might illude a reader, or worse, make the wrong point about words and their limitations all together. So I didn’t make that leap like my professor advised. Trust is a hard thing to give to readers. Giving them the poem would be a declaration of love far beyond my own comfort. The poet can mantain as much control over the poem as they please… the best poets, I have found, give up that control for something greater. There is a trust element with poetry. It takes great trust to believe that the listener will care as much as the poet to the verse and the lines, and the way the words fit together. It mean much more the poet now, but again, think of the readers in levels of interest and appeal to all degrees of audiences. Make it would lovely, make it ignite emotion, make it sound compelling, and make it richer with more investigation. Finally, let go of the reins so that they can do some leg work. My professor told us, the best poems are the ones which require some investment on the reader’s part. By taking part they can claim the secret knowledge as their own.